In a global culture, where boomers to whatever post-millennials will be called, reels from the collapse of the welfare state, the end of democracy, climate change, Brexit, Trump and god knows what else comes up on the news feed in the next 24 hours, cheering on the Allied Powers against old school fascists (the kind who haven’t been invited to an Economist panel), might just be comfort cinema at its most guilt free. Into this zeitgeist of longing for simpler times when pressure was a “Messerschmitt up your arse”, a line quoted with bravado by many a pasty faced, lager sodden fund manager, comes Hurricane. 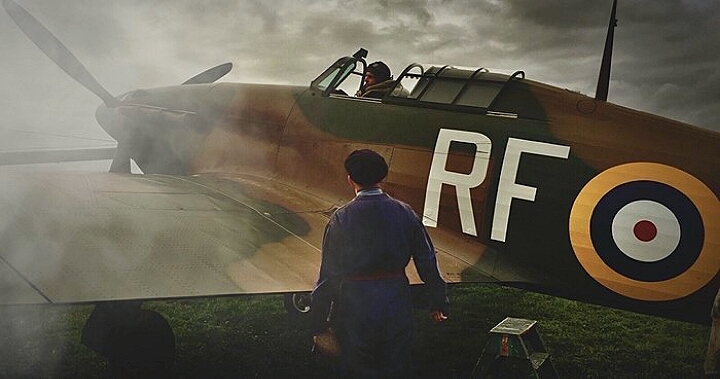 Based on a true story (which seems to have had much of its dramatic potential beaten out of it during development), Hurricane is a well-intentioned account of Polish air force pilots who fled the Nazis and sought revenge by helping the RAF fight the Blitz. In the film, a combination of bureaucratic resistance and good old-fashioned xenophobia slows down Jan Zanbuch (Iwan Rheon) and his fellow exiles from getting in the air. Thanks in part to the efforts of a Canadian officer (Milo Gibson) seconded to the RAF, the Poles are enrolled in flight training and then allowed to form Squadron 303. In real life, Squadron 303 made an impressive contribution to the fight against the Luftwaffe along with 15 other Polish manned squadrons in the RAF. The bulk of the film is punctuated by ambitious aerial sequences, which capture a sense of this real-life achievement (alas compromised by not particularly seamless CGI work) and a tempestuous romance between Jan and Phyllis Lambert, an Air Command clerk (Stephanie Martini). Hurricane is executed with such wide-eyed sincerity about Britain at War that it makes David Lean and Noel Coward’s In Which We Serve or William Wyler’s Mrs. Miniver seem like the work of the Dziga Vertov Group. This is a “Based on a True Story” that often feels blander than fiction. While Hurricane delivers period details and its heart is in the right place, the end result all too often feels like the world’s most earnest Vintage convention. Director David Blair, best known for his work on Jimmy McGovern’s Common series on BBC and the horror film, The Messenger, sets up and executes proceedings with efficiency. The actors also perform with heroic enthusiasm given how thinly their roles are sketched. When the focus is on Rheon, Krystof Hadek and the other actors playing the Squadron members, the film gets the spark and grit it badly needs elsewhere. However, these qualities aren’t enough to overcome the sense that we have seen this all before; and if not done with more originality, at least a greater sense of the stakes. Blair makes the most of his modest budget, but he is working in a production environment that discourages the kind of maverick ingenuity seen in Kevin Brownlow’s It Happened Here or Stuart Cooper’s Overlord. Produced by Rakuten, a new production company aimed at the growing market for theatrical releases that also get a speedy release on streaming platforms, Hurricane enters a digital landscape almost as brutal as the skies above the English channel c.1942.